The goal of this lab was to understand how changing parts of a reaction will cause it to shift more towards the forward or reverse reaction. The elements things such as temperature and concentration of the compounds in the reaction to observe the effects by watching the color of the solution. Put on goggles, gloves and aprons to ensure safety. Get a well plate and label the first columns 6 columns 1-6 respectively, and a-d for the first four rows down. Place 5 mL of the cobalt solution in a test tube. Put drops of HCl into the test tube until the color of the solution turns purple. Once it turns purple put it in the beaker of hot water that was prepared in step 1 and watch for a color change. Place ice cubes in a 250 mL beaker with some water. Take the test tube out of the hot water beaker and place it in the ice bath. Watch again for a color change and record observations. Dispose of all chemicals responsibly and ask teacher what to do with them. In this lab you can conclude that by changing certain aspects of the reaction such as how much water there is, how much cobalt there is, or the temperature of the reaction. 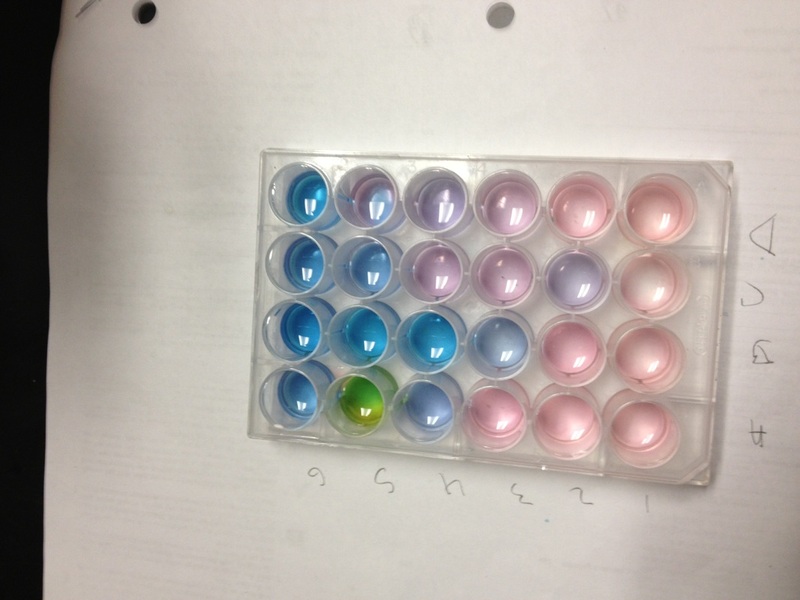 When more reactants were added, or temperature was increased, the reaction would move to the right and turn blue. If the amount of products were increased or temperature was decreased the reaction would shift to the left and it would turn pink. The main theme of this lab was to understand how Le Chatlier's Principle works. In this principle, it states that if a system in equilibrium is subjected to stress, it will shift in a certain direction to obtain equilibrium again. The three main stresses are changes in concentration of any of the compounds in the reaction, changes in temperature of the reaction, and changes in pressure or volume of gasses that are in equilibrium. Two of these stresses were seen in the lab. By changing the concentrations of reactants or products in the lab, the reaction would shift accordingly to go back to equilibrium. By adding HCl to the reaction, it caused the reaction to shift to the right and thus made the solution appear blue. This is because HCl was on the reactants side and it was increased therefore the reaction shifted to the right to obtain equilibrium again. When H2O was added, a product, the reaction became and even lighter pink because the reaction was shifting left to obtain equilibrium. Heat was also added or decreased in the lab and caused the reaction to change colors. 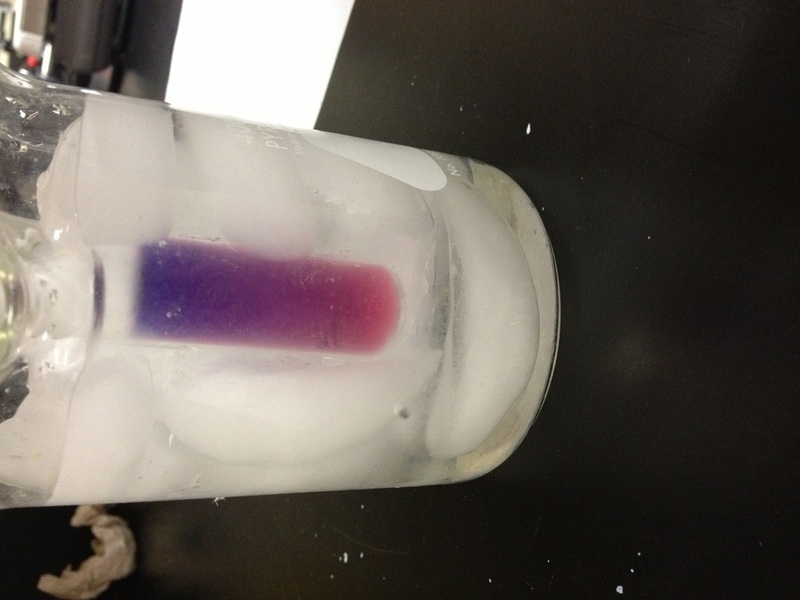 When the purple solution of CoCl2 and HCl was heated, it turned into a blue color. This means that the reaction shifted right. When the solution was cooled, the color turned to a light pink indicating a leftward shift of equilibrium. Due to these results, it can be concluded that this reaction is endothermic. When temperature is increased, that extra heat needs to be used up to balance out the reaction and thus created more products which is true to an endothermic reaction. The other part of Le Chatlier's Principle is the change in pressure or volume of gasses. This concept was not observed in the reaction. When pressure on a reaction is increased, equilibrium will shift towards the side with fewer moles so that it takes up less space. If pressure was decreased the opposite would happen. When volume is decreased, it works the same as if pressure is increased. Equilibrium will shift towards the side with fewer moles of gas. When volume is increased, the side of the reaction with more moles will be favored and equilibrium will shift in that direction. One source of error was that the wells in the tray that was used were not completely cleaned out from previous uses. This caused of the wells to display a green color because a contaminant had entered the reaction. A second source of error is that the water may not have been pure. It was taken from a faucet which will have traces of other compounds in them other than H2O which could have changed some of the results of the lab. Another source of error is the size of drops that were used to form the solutions. It is very hard to have a consistent drop size to put into a solution therefore some of the solutions may have more or less than expected based on the procedure. Le Chatlier's principle states that if a system is in equilibrium and is put under stress from change in concentration, temperature, volume, or pressure it will shift in the appropriate direction to obtain equilibrium again. When equilibrium is reached, the rate of the forward reaction equals that of the reverse reaction. The stresses that will be studied in this experiment are changes in concentration of products and reactants and changes in the temperature of the reaction. The name given to compounds that have water as part of their structure are hydrates. The safety precautions that must be observed with HCl and AgNO3 are to wear gloves, goggles, and aprons to prevent contact of these chemicals with the skin which can be very harmful. a) The reaction will shift right towards the products. b) The reaction will shift left toward the reactants. c) The reaction will shift towards the left. a) The reaction will shift to the right towards the reactants. b) The reaction will shift left towards the reactants. c) The reaction will shift left towards the reactants. d) The reaction will shift right towards the products. d) The reaction will shift left towards the reactants. When AgNO3 was added, it split up into its ions, Ag+ and NO3-. The Ag+ ions reacted with the Cl- ions to form AgCl (s). Therefore the concentration of Cl- ions were decreased and the reaction will have to shift left to reach equilibrium again. The reaction shown in the introduction is endothermic. This can be concluded because when the solution was put into the beaker of hot water, the color of the solution turned blue. The color change to blue indicates a shift towards the products as shown in the intro. reaction. When the solution was put into the beaker of ice water, it turned pink indicating a shift towards the reactants. In an endothermic reaction when heat is increased, heat needs to be used up to balance out the reaction and shifts toward the products. This is observed in the reaction and shows that the reaction is endothermic. The addition of sodium chloride would shift the equilibrium to the right towards the products because adding NaCl would increase the concentration of Cl- ions. This is because NaCl will split up into ions when it enters the solution and Cl- will increase. You would expect to have more solid silver chloride because the Keq value is greater than 1 which means the forward reaction is favored. Since AgCl (s) is in the products there will be more of the solid than the ions.